We all know that Sen. John McCain (R-AZ) is an angry, angry man. McCain is famous for having been a POW during the Vietnam War, surviving years of torture in order to return home and seek elected office. It must have been a personal milestone, then, to be elevated to Chair of the Senate Armed Services Committee following his party's triumphs in the mid-term elections. McCain's image had been tarnished by his choice of running mate in the presidential election where Obama beat him. The former governor of Alaska seemed so brazenly ignorant and yes, dumb, that it was hard to credit McCain's judgement in choosing her. Unless, of course, he was determined to lose the election and thus play his part in what Frank Zappa famously called, "the entertainment division of the military-industrial complex." Henry Kissinger, on the other hand, the exalted geriatric warmonger (see the citizens' idictment against him here) who bears major responsibility from having put McCain in harm's way in Vietnam -- his very presence is apparently enough to make McCain's heart swell with pride. Imagine getting to chair a hearing with Kissinger as the honored guest! Such are the dreams that might keep a young airman imprisoned in the "Hanoi Hilton" from going mad. Then, along come women -- women! -- dressed in pink, no less, to spoil the greatest day of your life. Women with the effrontery to speak out of turn, disrupting the start of your hearing in the hallowed chambers of power. 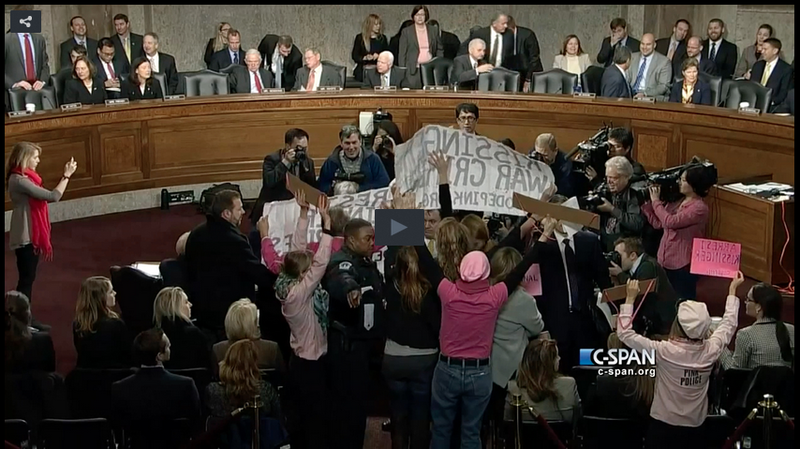 McCain appeared to lose his temper when he said, "Get out of here, you low-life scum" to Codepink's Alli McCracken, among others. Or, maybe it was a Freudian slip, since it would be difficult to find a scummier creature on this planet than Kissinger. Should a powerful Senator and former candidate for the highest office in the land really have to call out, "If we can't get the Capitol Police in here immediately..." Such a plea for backup could make the pleader appear weak in his own eyes, and in the eyes of his hero. HENRY... DOCTOR KISSINGER, I HOPE THAT... ON BEHALF OF ALL OF THE MEMBERS OF THIS COMMITTEE ON BOTH SIDES OF THE AISLE, IN FACT, FROM ALL OF MY COLLEAGUES. I WOULD LIKE TO APOLOGIZE FOR ALLOWING SUCH DISGRACEFUL BEHAVIOR TOWARDS A MAN WHO HAS SERVED THIS COUNTRY WITH THE GREATEST DISTINCTION AND I APOLOGIZE PROFUSELY. People often ask what is the point of such disruptions. 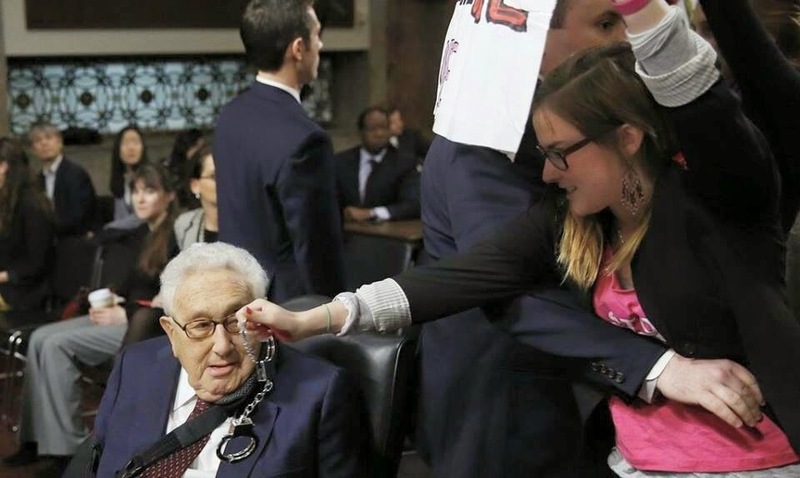 Henry Kissinger got fawned over, not led away in handcuffs. Madeleine Albright was not called to account for the deaths of thousands of children in Iraq under U.S. sanctions prior to Shock and Awe, deaths she said were a price worth paying. The point is that the message HENRY KISSINGER WAR CRIMINAL was seen by millions around the globe, including lots of young people for whom Kissinger is a cipher. The Vietnam war and the bombing of Cambodia and Laos are history to millennials and all who follow. It's why the Pentagon has embarked on an enormous propaganda campaign to rewrite the history of the U.S.'s genocidal exercise in Southeast Asia. And also why the organization Veterans for Peace, founded by Vietnam vets now long of tooth and grey of hair, has mounted its own campaign to tell the truth about that war. Their website for the purpose, Vietnam: Full Disclosure, will be a resource for educators for years to come. Unless information control in the 21st century becomes even more insidiously effective. In which case, we'll all be reduced to accepting McCain and Kissinger and Albright's versions of history. And that really would be a tragedy. 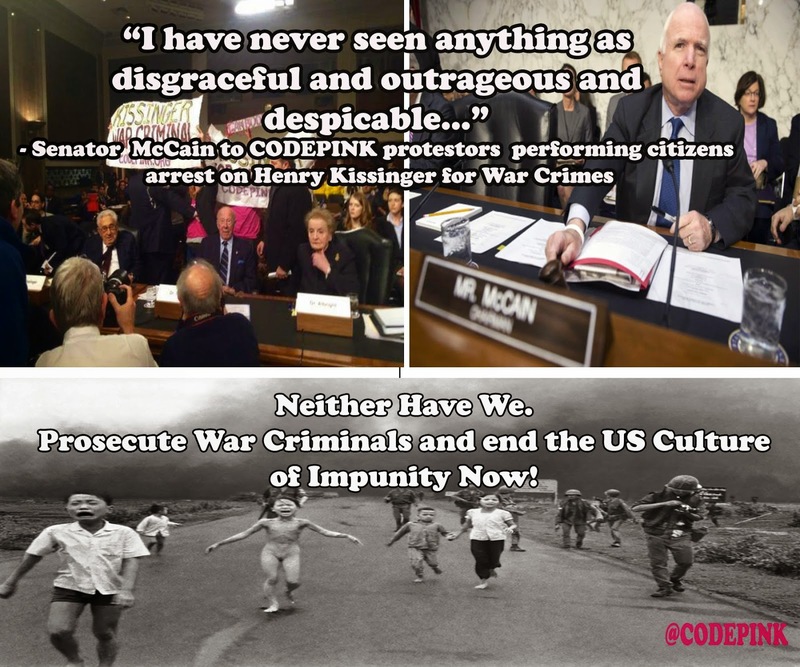 UPDATE: Is McCain seeing red (or 'green') over Code Pink? I once thought McCain was smart. After his tirade against truth tellers, I'm not so sure he knows who the real enemy is.